Venkman's colleague and best friend. A hard scientist with a good academic background, Stantz is a maverick who genuinely loves a challenge. -Ray was portrayed by Dan Aykroyd, who is admittedly interested in the paranormal and occult, which may explain why Ray seemed to be the most motivated of the Ghostbusters..."busting heads-in a spiritual sense," of course. 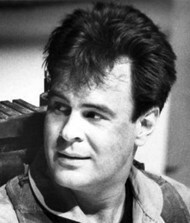 -Dan Aykroyd helped to design the proton pack, trap, and other "busting tools." -Even though Ray seemed skeptical about the existence of God, he DID seem to have a working familiarity with Biblical folklore, although his quote from Revelation was off by a chapter. And even described (with Venkman) to Mayor Lenny that NYC's takeover had Biblical, "Wrath-of-God" proportions. In the Video Game his description of Black Slime implies he believes in the concept of a soul. Additionally, he spoke of playing 'Ghosts and Gargoyles' in seminary, which is generally a Christian graduate school in most circumstances. -In the novelization, Ray's relatives were listed as a bisexual sister with a daughter, and a macho brother with two boys in military school. Ray's father, also a doctor, willed him the house not because he felt Ray was more worthy, but that after Peter had come with him to a family dinner once and seduced Ray's sister, he figured Ray was going to need all the help he could get. -Also in the novelization, Ray's parents were said to have disappeared in a plane flight that vanished without a trace. Egon kept insisting to Ray that they might still be alive in the Bermuda Triangle, until Ray finally punched him. -The "dream sequence" where Ray is seduced by a widowed ghost was actually originally filmed as an actual mission. Ray and Winston were sent out to a museum. On a lark, Ray had decided to try on a Napoleonic era uniform and was lying on a replica bed when she appears. This scene was later re-edited into the movie as a dream. A picture of Ray and Winston exiting Ecto-1 in front of the museum can be found in a storybook based on the film, although it wasn't referred to in the story anywhere. In real life, Aykroyd was filmed driving the Hearse off of private premises, before authorities arrived on scene. -Possibly for being the most open-minded of the group, his body and will were possessed by Vigo the Carpathian. -Aykroyd made a cameo appearance as a mustachioed Ray Stantz in the 1995 live-action Casper film. He was defeated by Casper's uncles and ran for his life. This cowardly portrayal angered a number of fans and is generally not considered canonical. -Ray's favorite foods seem to be Chinese, Greek, and Chicago-style pizza. He finds Thai food too spicy. "Of course you forget, Peter. I was present at an undersea, unexplained mass sponge migration." "Symmetrical book stacking. Just like the Philadelphia mass turbulence of 1947." "Ready... Get ready... GET HER!" "Well, this is great. If the ionization-rate is constant for all ectoplasmic entities, we can really bust some heads... in a spiritual sense, of course." "You've never been out of college! You don't know what it's like out there! I've *worked* in the private sector. They expect *results*." "My parents left me that house! I was *born* there!" "Hey! Does this pole still work?!" "Wow. This place is great. When can we move in? You gotta try this pole. I'm gonna get my stuff. Hey. We should stay here. Tonight. Sleep here. You know, to try it out." "Everybody can relax, I found the car. Needs some suspension work and shocks. Brakes, brake pads, lining, steering box, transmission, rear-end." "Uhhh... this magnificent feast here represents the *last* of the petty cash." "Don't look directly into the trap!" "This is where we store all the vapors and entities and slimers that we trap. It's simple really. Loaded trap here...open and unlock the system...insert the trap...release...close and lock the system...set your entry grid...neutronize your field...and the light is green, the trap is clean. The ghost is incarcerated here in our custom-made storage facility." "Forget MIT or Stanford now! They wouldn't touch us with a 10 meter cattle prod!"